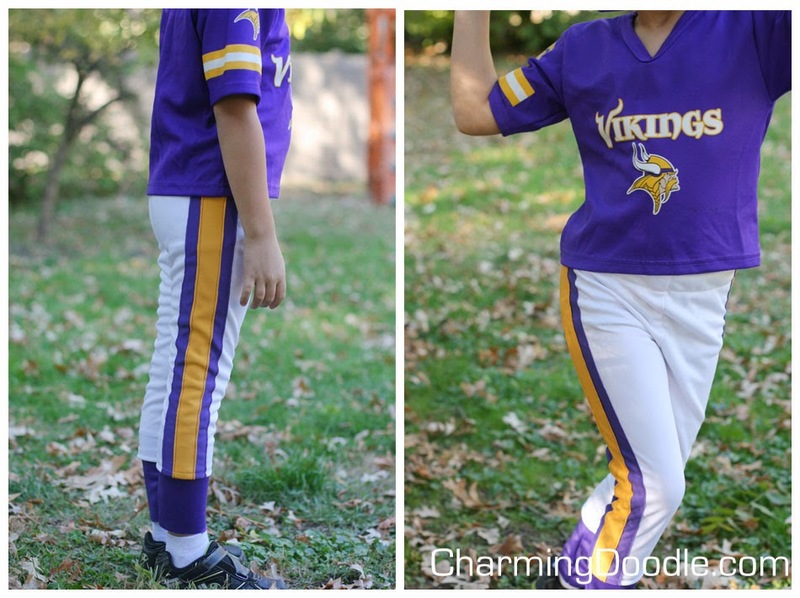 I thought I had the kids' costumes all finished...but after seeing the size of the pants with the Vikings costume Elliott planned to wear, I knew I had to whip up one more thing for Halloween. 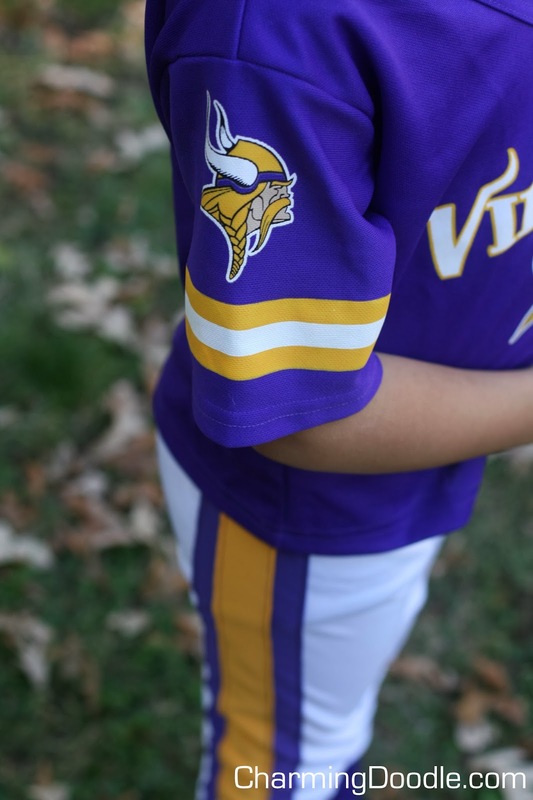 Elliott has worn his Minnesota Vikings football costume each of the past 3 years at least once. 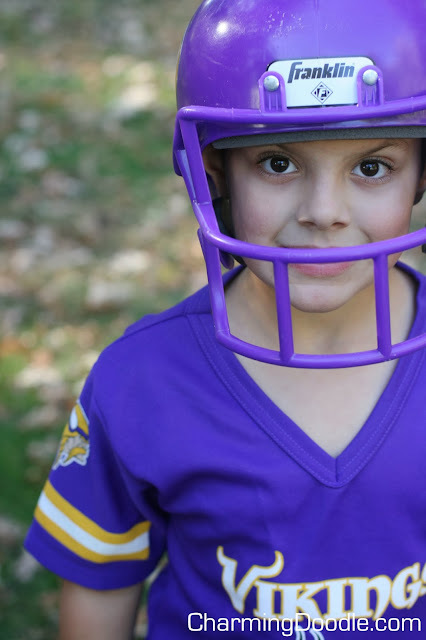 We go to several Halloween events so sometimes the kids get to try out other costumes, and the Vikings player has always been a favorite. The pants for the uniform are probably a size 3T...not exactly right for a 7 year old! Elliott loves it and it's always fun to see the reaction people have to his costume. Sometimes he gets extra candy (from fellow Vikings fans), but more often than not people give him a hard time about his team. The other two things I whipped up for KCW were actually at the request of Emma's Kindergarten teacher. She thought it would be fun to have a 'helper of the day vest' for the student acting as the classroom's special helper. She wanted the boys' vest to be camouflage and then to have a girl version as well. Emma was thrilled when I let her go to the fabric store with me and choose the vest fabric. It's definitely not what I would have chosen, but I won't ever have to be the one to wear it. Ha! 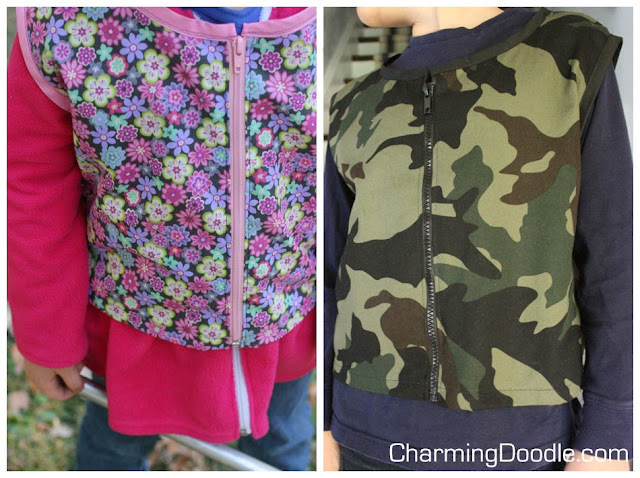 The biggest challenge was to make a vest that would fit the variety of sizes that Kindergartners can be. So this vest fits Elliott (a first grader on the big/tall side) and also fits Emma (one of the most petite kids in Kindergarten). I made a pattern for this vest as I cut it since I had to sew two of them and didn't want to re-figure it out the second time. If anyone is interested in making a vest like this just leave a comment and I'll scan the pattern and post it along with a few steps in a mini-tutorial.